Love chocolate but dodging dairy? Looking for a sweet gift for a vegan friend? Here are the best places to get vegan chocolate in London. With two venues in close proximity to each other on Brick Lane, cocoa house Dark Sugars is best-known for the extravagant hot chocolates served in its cafe, towering with chocolate shavings (alas, not currently available vegan). 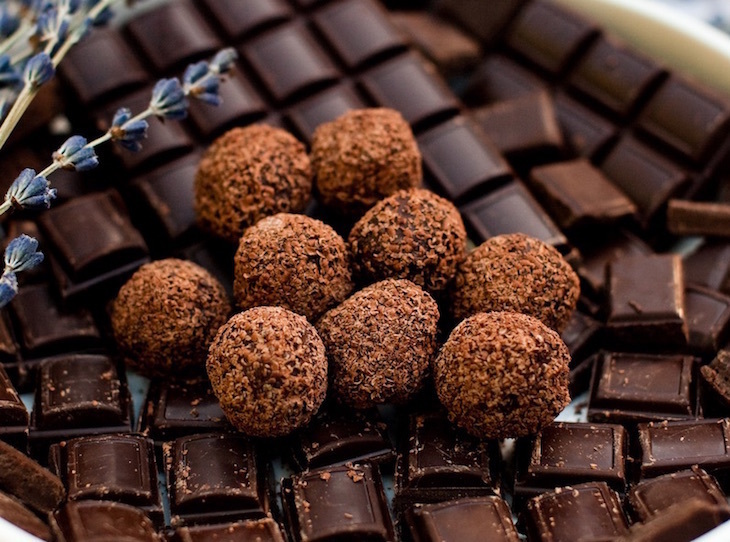 But those who like their chocolate in solid form are well catered for too, with an extensive range of unusually-flavoured truffles and chocolate-covered fruits spread out in wooden bowls and sold by weight, like a traditional-market-meets-old-fashioned-sweetshop. Dark Sugars extends its adventurous flavours to its impressive vegan range. 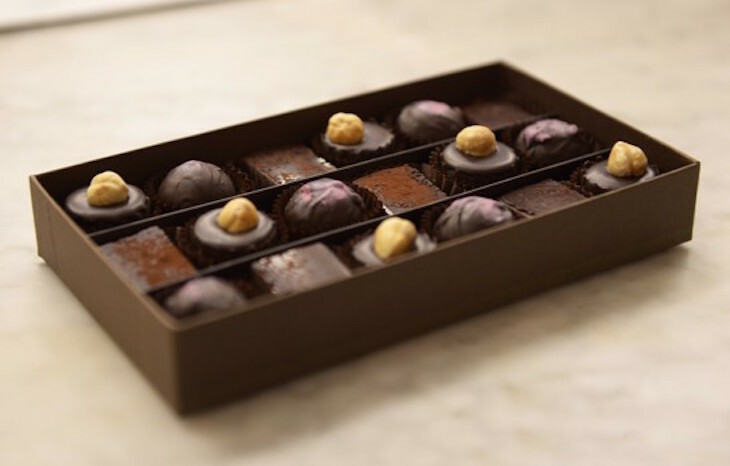 Chocolate-covered mango slices, orange rinds, various nuts, cherries and figs are available free of dairy, as are the chilli-infused truffles and stem ginger truffles. Labels on each product offer dietary information to make it easy to see what's suitable for your needs. See the full Dark Sugars vegan range. Look for the green 'vegan-friendly' sticker on products at west London boutique Artisan du Chocolat — they're completely free of animal derived products, and any butter mentioned in the ingredients is cocoa butter. The vegan range is predominantly flavoured dark chocolate bars, such as chilli, black cardamom or tobacco. The milk chocolate bar uses almond milk, and for something a bit more adventurous, try the chocolate covered ginger pieces or orange slices. 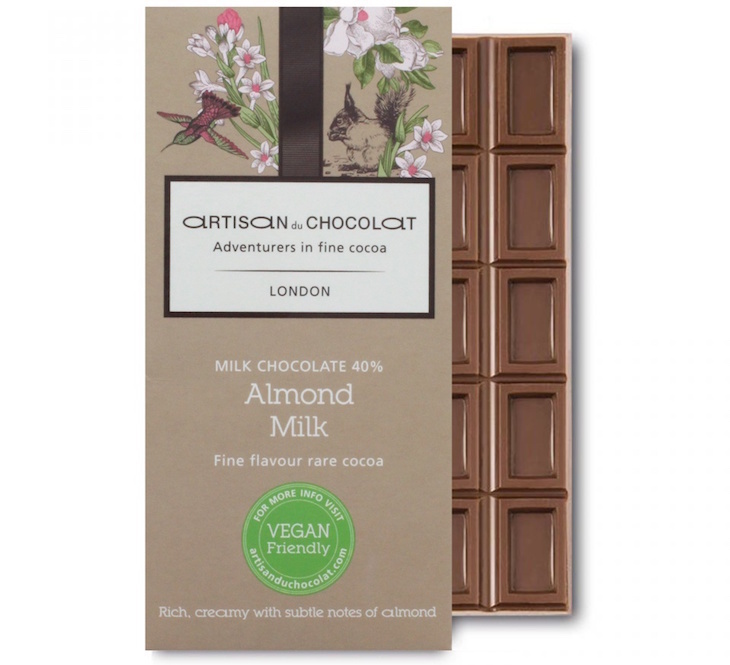 See the full Artisan du Chocolat vegan-friendly range. All of the dairy-free chocolates at this Brentford shop and chocolate kitchen are vegan (with the exception of a few products that contain honey, a controversial product among vegans honey — check before you buy), made by Hungarian chocolatier Bianca Marton. She uses coconut cream and cocoa butter as dairy replacements, hand making truffles and chocolate bars that can be purchased individually or part of a gift selection box. They're all exquisitely decorated too. At time of writing, current truffle flavours include mint & maple, tequila and lime, sea salted caramel, coffee praline, and lemon, proving that vegan definitely doesn't mean boring. Hand-decorated Easter eggs in various sizes are available for Easter 2019, from boxes of bite-sized treats, to an extra-large offering dusted with gold shimmer paint. Find out more about the ingredients used, and browse the full range. All products are available to order online. Melt's chocolates are all made freshly in the kitchens in Notting Hill and Holland Park, which means the company has complete control over what goes into its products — and in the case of the vegan range, that means cocoa butter replacing dairy. Mini bars of chocolate, boxes of truffles (think praline, and berry & almond) and gift hampers are available year-round in the vegan range. For Easter 2019, vegan Easter eggs have been created too — choose from the traditional dark sea salt, the rather more playful strawberry (designed to look and taste like the fruit), or the arty Van Gogh blossom egg (it *probably* doesn't taste like paint...). See the full vegan range at Melt. 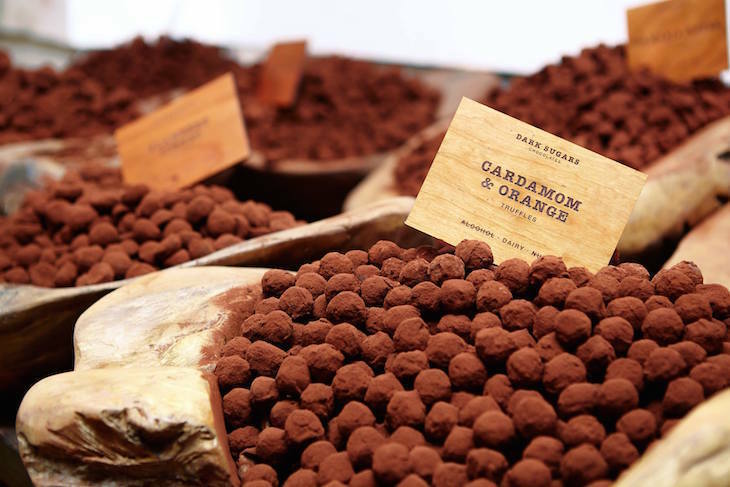 London has its own vegan chocolate factory, Kennard's, where dairy-free bars and truffles are made on a daily basis, and all ingredients are certified by The Vegan Society. We went behind behind the scenes in 2018 to see how the products are created. The website sells all of the current flavours Kennard's has to offer, which can be delivered too. 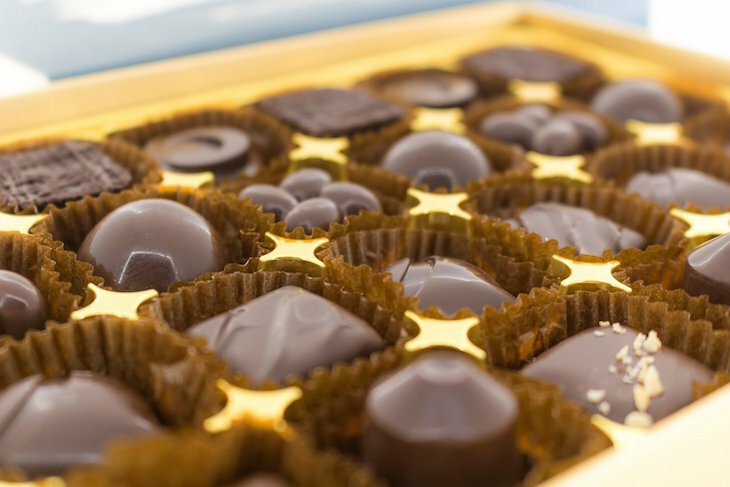 Sure, the basics like chocolate buttons are readily available, but why settle for basic when boxes of chocolates are available in flavours such as peanut butter & jelly, strawberry fondant, and smooth caramel. The bars are equally as tempting — how about chill & cardamom, raspberry & lavender, or peppermint. Can't choose? Sign up to the Vegan Club and get a surprise selection of vegan chocolate sent to your door each month. See the full range of Kennard's vegan chocolate. High street chain Hotel Chocolat has a decent range of vegan Easter eggs, including child-friendly rabbits and bunnies, and ginger and mint flavoured eggs for the grown-ups. Our pick, though, is the Extra Thick Easter egg, constructed with such dense walls, we challenge any chocoholic to polish off half an egg in a single sitting — oh, and it's filled with nuts and buches for extra indulgence. 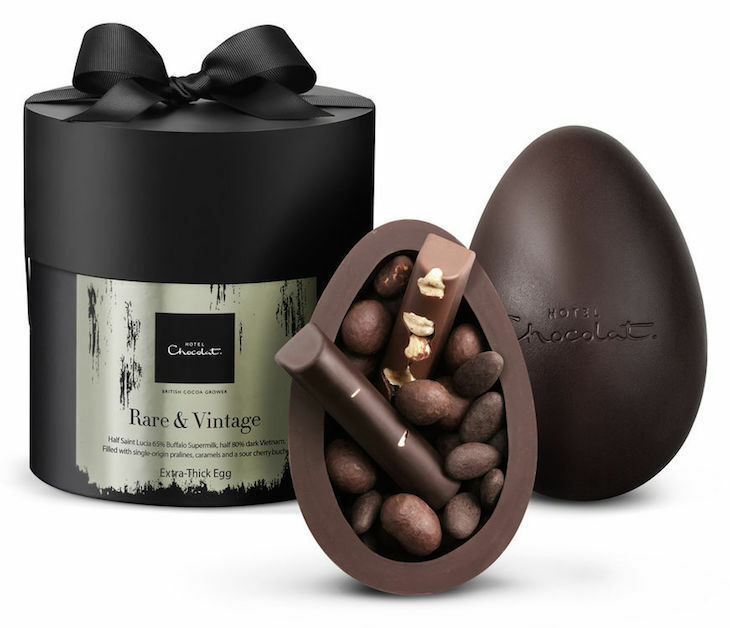 See the full Hotel Chocolat vegan Easter range. Another chain high street store catering well for vegans this Easter, is health food specialist Holland & Barrett. 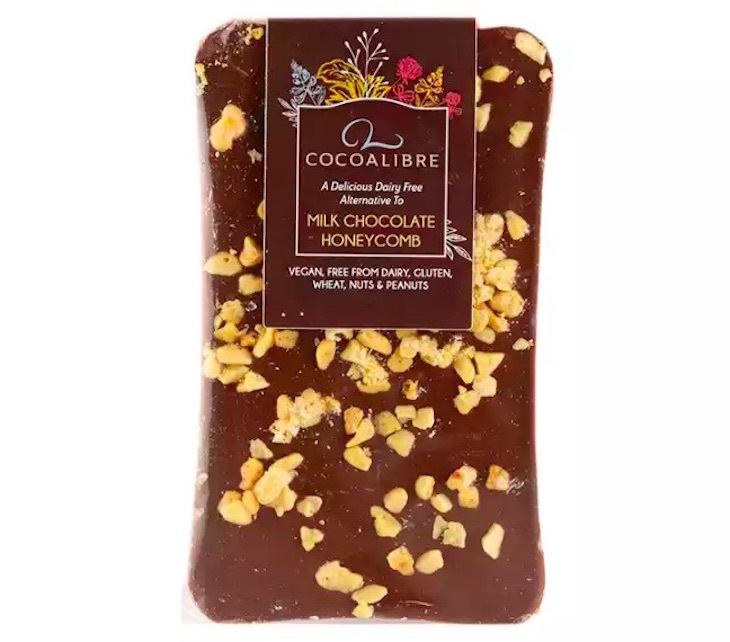 Chocolate bars, hazelnut truffles, traditional eggs, chocolate orange frogs, mini eggs and more are available from a variety of manufacturers, each offering their own dairy alternative in their products. See the full Holland & Barrett vegan Easter range.